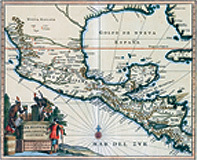 OUR REGION’S CARTOGRAPHIC TRADITION traces back to pre-Columbian times. Avid traders throughout the Mesoamerican isthmus, the ancient Maya had a clear concept of distance and time, which they transmitted through hieroglyphic writing both carved in stone and painted on ceramic vessels and walls. Another medium was the beautiful and fascinating pictorial paintings on cloth (lienzos), in which history, narration and cartography melded together as geographic expression. Our roster of lecturers for the symposium is exceptional: pioneering thinkers, all. As an institution, we bring our two museums on campus into the mix for an intimate look at the latest archaeological research and Guatemala’s rich textile weaving tradition. Universidad Francisco Marroquín is proud to host the 25th Symposium of the International Map Collectors’ Society in February 2007. I, along with our students and professors, am looking forward to meeting and exploring ideas with the gamut of talents, expertise and academic disciplines of the symposium participants. UFM is a private, non profit university. Our mission is to teach and disseminate the ethical, legal and economic principles of a society of free and responsible persons. WE ARE GETTING CLOSE! Six years after floating the idea in Iceland of a symposium in Guatemala, we are in full swing with preparations backed up by a great group of volunteers and UFM’s team of technology wizards. We are proud that our IMCoS event has inspired UFM to establish a map division at its library. And, as we spread news about the symposium, we are thrilled to discover lots of map lovers, some of whom possess their own fine maps and are eager to learn more. We know from experience that participants at our international gatherings are not satisfied with theories and tales. We all want a first hand look at the country we are visiting, and our travels with learned friends and local experts are a highlight of all International IMCoS symposia. With this in mind, we have designed our post-symposium tours to give you a special insider’s look at the many facets of Guatemala. So please come! Bring your family and friends. Remember they do not have to be members of IMCoS. We think that the chance to visit our country with such a distinguished group will leave you with the memory of a lifetime. Primer simposio celebrado en América Latina.